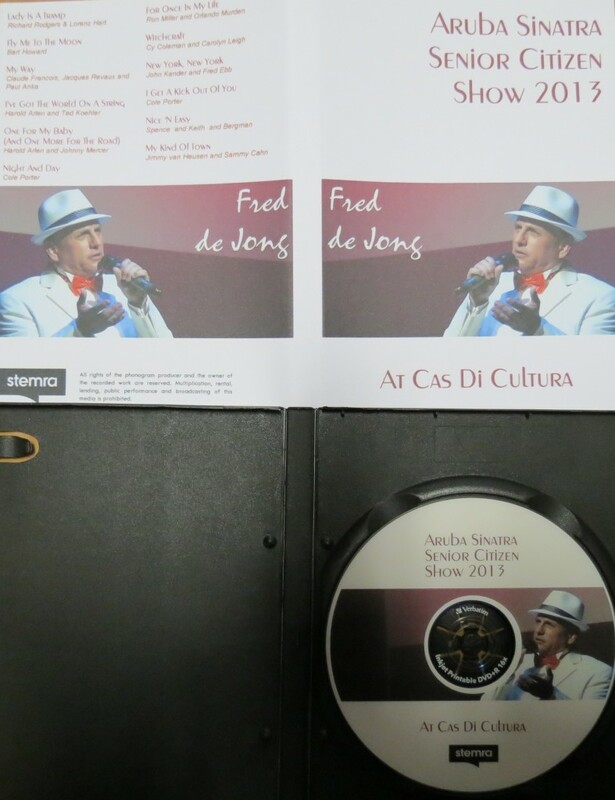 Here is your signed Collector’s Item, recorded at the Aruba Sinatra Senior Citizen Show at Cas di Cultura on October 30th, 2013, where you will experience and feel how Fred transforms Music into true love! October 31st, 2013 – – Oranjestad, Aruba – – The first (1st) edition of the Aruba Sinatra Senior Citizen Show was free of charge for all the senior citizens in Aruba. Fred de Jong and a small team organized a special show in the Auditorium at Cas di Cultura, where all the magic happened. Many of the invited Senior Citizens from the homes and senor clubs showed up and enjoyed a wonderful Sinatra Show, existing of two (2) times forty-five (45) minutes of ShowTime and a half (1/2) hour break, where everyone was able to talk about their special experiences during the show. Twenty-seven (27) songs in the style of Frank Sinatra, Michael Buble and Harry Conick jr. have been performed, which are written by song writers like Richard Rogers, Lorenz Hart, Harold Arlen, Ted Koehler, Johnny Mercer, Antonio Carlos Jobim, Cole Porter, Cammy cahn, Jule Styne, Cy Coleman and Carolyn Leigh and many others, with arrangements made by arrangers like Quincy Jones, Billy May, Don Costa and Nelson Riddle, songs that contributed to many of your precious memories. Presentation with photo’s and video’s from way back when. A beautiful PowerPoint Presentation was being showed with logos from Sponsors and photo’s and video’s from Skylines, Fred de Jong, Frank Sinatra and other performers from Sinatra’s life and times, which remembered of way back when. The audience was clapping and singing along with some of the songs, which can never be left out. During the less famous songs the audience was listening breathless and you could hear a pin drop. Fred de Jong didn’t stay on the podium only, but also walked between the audience while performing the songs. Fred captured Frank beautifully and sang a very wonderful repertoire of his songs. The sponsors and people who bought tickets made it possible that costs could be covered, Senior Citizens were transported, drinks and snack were server after the show, organization and promotion were executed. According to the entertainer Fred de Jong: “I would like to thank everybody who made a remarkable marvelous night possible with the Senior Citizens in Aruba. You were a great audience! It was also a great honor to welcome the famous Padú del Caribe (Father of the Caribbean, né Juan Chabaya Lampe) who, is an Aruban musician and songwriter who has been recording and composing for several decades. He wrote “Aruba Dushi Tera”, a waltz that is now the national anthem of Aruba and was long a rallying cry for separation from the Netherlands Antilles, which was achieved in 1986.